The /Xam San people, known in colonial times as the Bushmen, are the original environmentalists. They see land as a source of life, a gift to humans that nourishes, supports and teaches - a true under-standing of our environment. The /Xam San had a word for this: #hannuwa! It means the gathering of good fortune through living in sustainable harmony with our environment. #hannuwa reflects the ancient African wisdom of the /Xam San people, which we embrace with enthusiasm. Environmentally friendly thinking and acting form the natural base of our venture. Bein Wine is owned and operated by the two of us, Luca and Ingrid Bein, and everything we do is guided by our quest for an ecologically sound and socially supportive environment. Our quest for sustainability extends to our entire environment, naturally including the people around us. Offering jobs with good working conditions, paying fair salaries and promoting previously disadvantaged members of our communities are for us a matter of course. Having worked for many years as vets in our previous careers, it goes without saying that we are passionate about nature. We run Bein Wine in the most sustainable way possible, based on scientific understanding and to the best of our knowledge. At Bein Wine, we follow the guidelines for sustainable practices of the OIV (Organisation International du Vigne et du Vin, Paris/F www.oiv.int ). We wholeheartedly embrace the initiative of the South African wine industry for a sustainable viti-viniculture in South Africa, as stated on the website of SWSA (Sustainable Wine South Africa) www.swsa.co.za , and we commit ourselves to their goals and declarations. 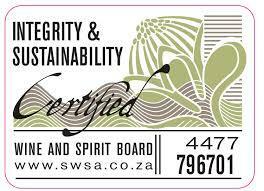 Bein Wine is certified by IPW SA (Integrated Production of Wine SA) for environmentally friendly and sustainable viti-viniculture.